Return radiosity summarized from all patches. Return current patch cache size. Now using priority queue to optimal usage of given memory. Definition at line 22 of file PatchCache.h. 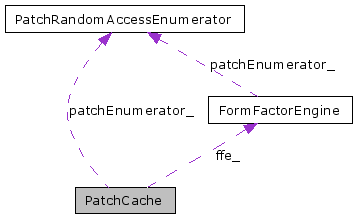 patchEnumerator Shared instance of PatchRandomAccessEnumerator. ffTreshold Pair of patches with smaller form factor than formFactorTreshold will be ignored. maxCacheSize Maximum size of patch cache (in bytes). Maximum cache size is raw size (estimated). The real cache size can be greater. This computation respectes form factor for each patch. destPatch Destination patch to compute radiosity for. This is raw size (estimated). The real cache size can be greater.